ONLY ONE WEEK LEFT TO VOTE IN THE HE PAY BALLOT! 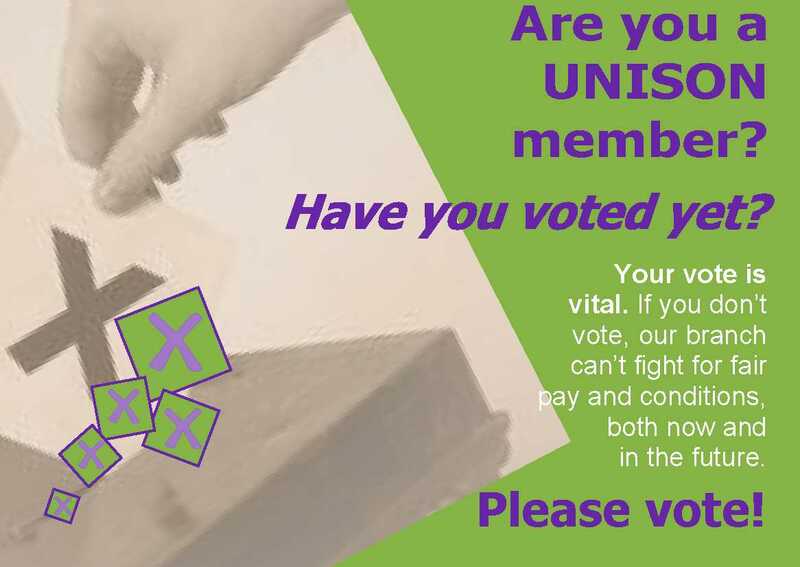 If you haven’t received YOUR ballot paper, or have lost it, you can request a new one via UNISONdirect, please call 0800 0857 857, lines are open Monday to Friday 6am to Midnight and Saturday 9am to 4pm. A high turnout in the ballot is essential, as by law we can only take strike action if we get at least a 50% turnout in an industrial action ballot. 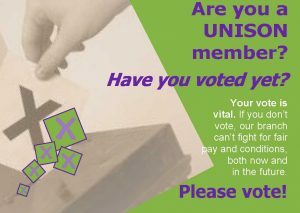 Over the summer, UNISON ran a ‘consultative ballot’ of our higher education members. This informal ballot was to see what members thought of the employers’ national pay offer for 2018/19. Over two thirds of those who voted rejected the pay offer and said they were prepared to take strike action to try and secure a better deal. Your vote is vital. Please vote and be heard.